Maybe you feel like you’ve gotten your fix of all things pumpkin spice but I say the season is only starting! 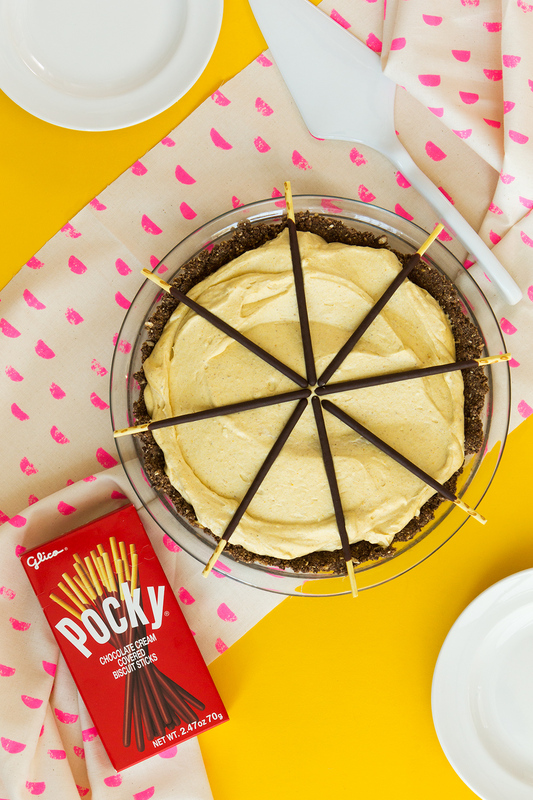 That’s why today I’m sharing my recipe for a no-bake Pocky pumpkin pie. It’s a twist on a traditional Thanksgiving staple. My version skips the oven for a dessert that can even be made a day or two ahead and will please even those pumpkin pie haters out there. Chocolate Pocky is crumbled to make a chocolatey crust that has just the right amount of crunch. It’s topped with a creamy whipped pumpkin filling that will make you want to lick your plate clean. It’s the perfect and oh-so-easy recipe to make for Thanksgiving so what you waiting for? Watch the video below to see how to make it! Remove Pocky from the box and crush the foil bags in your hands. Place the contents of three bags in the bowl of a food processor or blender. Pulse until the Pocky resembled bread crumbs. Pour crumbs into medium mixing bowl and add 5 tablespoons of melted butter. Stir until combined. Pour Pocky crumb mixture in a pie pan. Use your fingers to gently press the mixtures into a flat crust. Place in the fridge until you’re ready to add the filling. To make the filling, mix the softened cream cheese, powdered sugar and all spices in a stand mixer fitted with a paddle attachment (this one is my favorite) or in a large mixing bowl if you’re using a hand mixer. Mix until all ingredients are combined and the filling is creamy. Add the canned pumpkin and vanilla extract. Mix until combined. Add the whipped cream and fold by hand using a large spatula. Transfer the pumpkin filling into the prepared crust and spread in an even layer. Garnish with a few Pocky sticks and return to the fridge, at least 4 hours, or until ready to serve. Enjoy! If you don’t plan on serving this pie until the next day, I’d wait on adding the Pocky on top until just before serving that way it stays nice and crisp. And if you want to serve smaller slices just add more Pocky to use as a portion guide. Love Pocky? Try one of my other sweet recipes for your Thanksgiving meal like Chocolate Pocky pops or homemade chocolate Pocky marshmallows. I seriously need to make this right now. Pinning for later!